In his book London Orbital, Iain Sinclair writes that Heathrow Airport—with its "inscrutable geometry," surrounded by "international hotels, storage facilities, [and] semi-private roads"—is utterly "detached from the shabby entropy" of London. Indeed, "Heathrow is its own city, a Vatican of the western suburbs." If Atlanta's Hartsfield-Jackson International Airport were to become its own country, its annual workforce and user base would make it "the twelfth most populous nation on Earth," as John Kasarda and Greg Lindsey explain in Aerotropolis; even today, it is the largest employer in the state of Georgia. I suspect that the airport will be the true city of the 21st century. The great airports are already the suburbs of an invisible world capital, a virtual metropolis whose fauborgs are named Heathrow, Kennedy, Charles de Gaulle, Nagoya, a centripetal city whose population forever circles its notional center, and will never need to gain access to its dark heart. 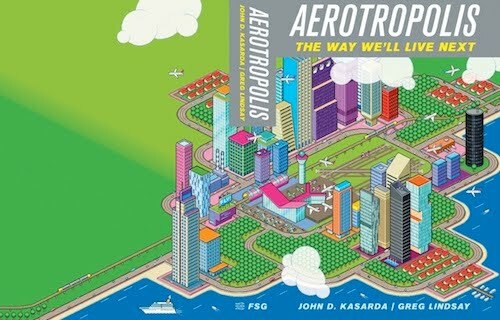 The remarkable claims of John Kasarda's and Greg Lindsay's new book are made evident by its subtitle: the aerotropolis, or airport-city, is nothing less than "the way we'll live next." It is a new kind of human settlement, they suggest, one that "represents the logic of globalization made flesh in the form of cities." Through a kind of spatial transubstantiation, the aerotropolis turns abstract economic flows—disembodied currents of raw capital—into the shining city form of tomorrow. The world of the aerotropolis is a world of instant cities—urbanization-on-demand—where nations like China and Saudi Arabia can simply "roll out cities" one after the other. "Each will be built faster, better, and more cheaply than the ones that came before," Aerotropolis suggests: whole cities created by the warehousing demands of international shipping firms. In fact, they are "cities that shipping and handling built," Lindsay and Kasarda quip—urbanism in the age of Amazon Prime. The world of the aerotropolis, then, is a world where "a metropolitan area's position in the airline network determine[s] its employment growth and not, as commonly supposed, the other way around." Or, as a representative from FedEx explains to Greg Lindsay, "Not every great city will be an aerotropolis, but those cities which are an aerotropolis will be great ones." Surely, though, this kind of breathless rhetoric is a reliable sign of hype. What are the real political and economic conditions of the aerotropolis; what transformations might it undergo in an age of peak oil and climate change; and who, in the end, will actually live there and manage it? This latter question seems particularly urgent: does the aerotropolis represent the culmination of the city's slow depoliticization—an urban form without mayors or democracy—run instead by a managerial class of logistics professionals and CFOs? Or do these very questions reveal a misconception about what the aerotropolis is and will be? 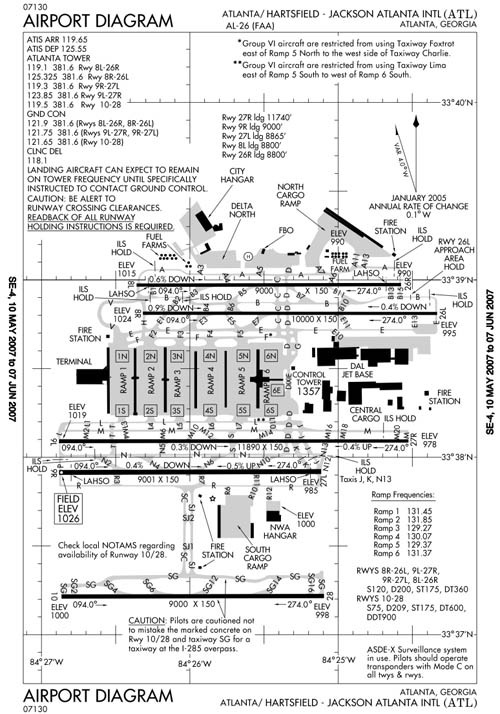 [Image: A plan of Atlanta's Hartsfield-Jackson Airport, via Wikipedia]. To begin to answer these questions, and in preparation for a live interview that will take place in Los Angeles on Tuesday, April 5, at the A+D Museum, I spoke to Aerotropolis co-author Greg Lindsay about these and many other topics, from the aerotropolis itself to instant cities, the appeal of the urban realm for today's technology firms, and metropolitan futurism circa Le Corbusier. The resulting conversation, included below, shows Lindsay to be both frank and refreshingly candid about the book. He is also someone clearly excited to talk about the future of the city, aerotropolis or not: simply to transcribe this interview, I had to slow the audio file down to nearly 85% of its original speed just to unpack Lindsay's jet stream of ideas and references. Consider this a teaser, then, for the event on April 5. Until that time, pick up a copy of Kasarda's and Lindsay's book to see what you think; and, if you get a chance, take a look at the second half of this conversation, during which the tables are turned and Lindsay interviews me for Work in Progress, the newsletter of Farrar, Straus and Giroux. There, we discuss the role of the architect in a world of smart cities and instant urbanism, the fate of criticism in the context of architecture blogs, and where we might turn next for tomorrow's spatial ideas. BLDGBLOG: Let’s start with the most basic question of all: what is an aerotropolis? Greg Lindsay: John Kasarda, of the University of North Carolina, came up with the idea twenty years ago—though, in researching the book, I found that word’s original appearance in print was actually in Rem Koolhaas’s Great Leap Forward, quoting a local Chinese official. Kasarda first heard it in China, as well. In terms of vision, I think there are really two definitions of it, depending on which of the two authors you speak to—Kasarda or myself. Kasarda’s notion of an aerotropolis is basically a city or a region planned around an airport. In his mind’s eye, everything is spatially divided by usage: hangars, cargo terminals, office parks, business hotels, six-lane highways, merchandise marts. There’s no real urban form at all. On one level, it’s like Edge City: the form is dictated by development money and the respective need for access to the airport at the center. But, on another, the design is glossed over or left out. In models and renderings, they never achieve a resolution above little white boxes. He sees the aerotropolis purely in terms of time/cost equations. Density and design is secondary. A layperson would describe it as sprawl. It’s an urban vision without any real urbanity. Then there’s my definition of it—and I think I take a broader view. I would describe the aerotropolis as any city that has a closer relationship to the air, and to other cities accessible through the air, than to its immediate hinterlands. It’s a city that was basically invented because of the necessities of air travel. Dubai, to me, is a perfect example of that. Thirty years ago, of course, there was nothing there; Dubai had little oil and even fewer people. But, basically through sheer will, it used its airport and its airline, Emirates, to build itself into a hub. It transformed itself legally and regulatory-wise, and made itself the freezone of the Middle East—and the pleasure den, and all the things it’s become. Dubai’s also interesting because it illustrates the grander vision of the book, which is that transportation always defines the shape and look of cities. Joel Garreau made this point twenty years ago, that cities are defined by the state of the art of transportation at the time. I think many of the cities we love today are classic railroad cities—such as New York, built around Grand Central Station, and Chicago, where the first skyscrapers sprang up across the street from the Illinois Central’s railyard. But the idea now is: if you’re building a city from scratch in the middle of China or India, then you’re building it around an airport. The airport is the city’s economic reason for being. You’re trying to connect to a global economy, starting from zero. Dubai is interesting in that regard. Nobody really understood what Dubai was about, or what they were trying to do there, but its plans make sense if you look at it from the perspective that there’s this theoretical population all dispersed across the Middle East and southeast Asia, and they’re all flying in to use the city in bits at a time. The notion of the aerotropolis, then, is basically that air travel is what globalization looks like in urban form. It is about flows of people and goods and capital, and it implies that to be connected to a city on the far side of the world matters more than to be connected to your immediate region. The aerotropolis spatializes what people like Saskia Sassen have been writing about for twenty years in books like The Global City. 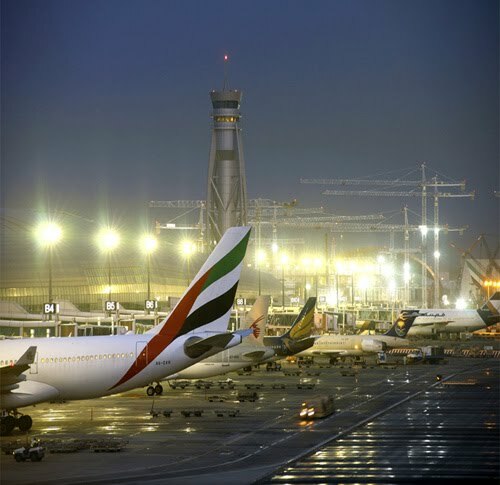 [Images: Dubai International Airport promotional images; vertical distortion is in the originals. 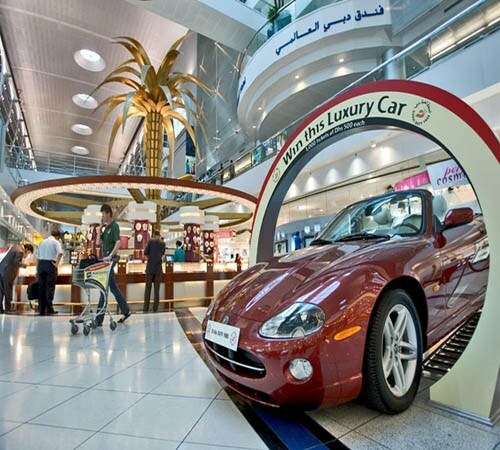 Courtesy of the Dubai International Airport Media Center]. BLDGBLOG: I’m curious about the political requirements for making an aerotropolis happen. On the level of regulation, zoning, and so on, what needs to occur for an aerotropolis to become realizable? Lindsay: Well, I always say that we built our airports in the United States before we knew what they were for. We didn’t really understand the scale of future operations or the geographic footprint they would need, so we built them within footprints that were never going to be sustainable for the levels of traffic they would ultimately absorb. So we ended up with places like LAX. 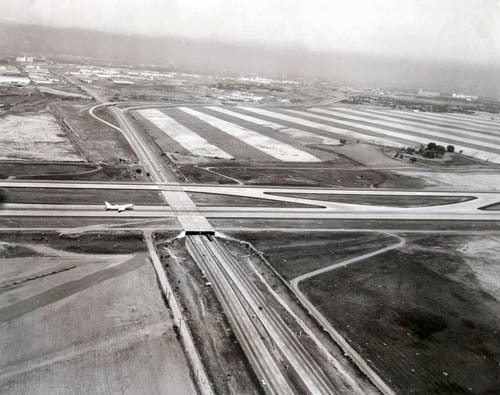 One of the things I love noting is that, when LAX was first built, it was criticized because the field was seen as too far from downtown—whereas, today, you have an airport that’s basically landlocked on all sides, and has been for almost fifty years. This puts LAX and Los Angeles in an intractable situation, considering the economics of air travel, which require concentration for hubbing, for operational efficiency, for all of that. It’s in the best interests of an airline to concentrate in one place—and LAX is a place that just cannot expand. The next stage is understanding the scale you need to operate on: you need to plan for a larger region. We talk about regional planning in the United States, but we do so little of it. We hardly even understand how economies cross what are almost arbitrary borders at this point, between counties and cities. I had difficulty finding reliable gross metropolitan product numbers, and Richard Florida had to go so far as to measure light pollution from space in one of his books. In Los Angeles, because of the failure of Orange County to build a second airport, if you’re going to fly internationally, and if you’re basically anywhere from Malibu to the Mexico border, you’re going to pass through LAX—which is a hell of a catchment area and an incredible strain to put on one airport. That’s partly due to when Orange County tried to build an airport at the former El Toro Marine base and ended up in a bizarre civil war: you had the right-leaning NIMBY interests on the side of the environmentalists, and you had the Chamber of Commerce siding with the poor immigrants of Orange County, because they wanted the jobs. It made for this schizoid conflict. To continue from a narrow American perspective, I think the examples of Memphis and Louisville are fascinating, where the sheer economic force of FedEx and UPS basically willed them into being. Those cities used to be river-trading towns—cotton and tobacco, respectively—before they became basically southern rustbelt towns. But then, in the 1970s and 80s, they were reborn as company towns of FedEx and UPS. In a sense, their economics—for better or for worse, and that’s very much up for debate—are held hostage by our e-commerce habits: every time we press the one-click button on Amazon, it leads to this gigantic logistical mechanism which, in turn, has led to the creation of vast warehouse districts around the airports of these two cities. One of the things I tried to touch on in the book is that even actions we think of as primarily virtual lead to the creation of gigantic physical systems and superstructures without us even knowing it. [Images: Laser-guided FedEx hub urbanism at work; all images courtesy of FedEx. Meanwhile, it is about UPS—not FedEx—but John McPhee's essay "Out in the Sort" is a minor classic in what I might call the logistical humanities]. BLDGBLOG: In this context, you point out in the book that Kasarda “proposes building cities by corporations for corporations, guaranteeing their survival by tailoring them to clients’ specifications—beginning with the airport.” The city is not an expression of human culture, so to speak, but a kind of 3-dimensional graph of economic activity. 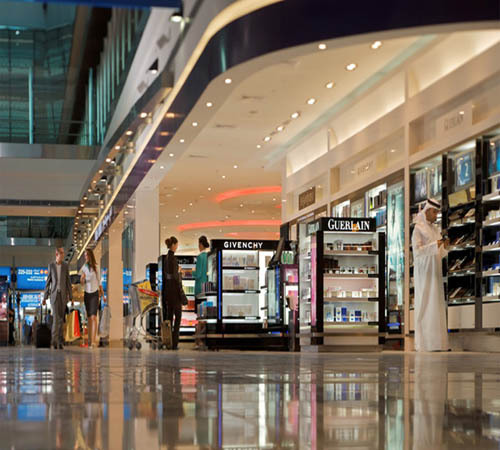 Lindsay: Yes, the aerotropolis—as Kasarda preaches it and as has been implemented in places like Dubai and elsewhere—is less about urbanity than repurposing the city as a “machine for living,” to quote Le Corbusier. The aerotropolis is basically an economic engine. Planners are looking for ways to make these cities as frictionless as possible in terms of doing business—which means that, in places like Dubai, the tax-free zones and enclaves such as Dubai Media City and Dubai Internet City and the Jebel Ali Free Zone can basically wage an economic war of all against all when it comes to competing cities. They were designed as weapons for fighting trade wars, and their charter—to be duty-free and hyper-efficient—reflects this. So it’s interesting in the sense that these cities are infrastructure-as-weaponry, which Rem Koolhaas wrote about in “The Generic City” [PDF]—“City X builds an airport to kill City Y.” They’re competing rather than complementing. China’s cities, in particular, are building infrastructure not as a way to improve urban living across these larger regions, but basically so that they can do battle against one another for attention and investment. BLDGBLOG: Sticking with Dubai, at one point you write: “High-functioning dictatorships such as Dubai’s don’t faze [Kasarda]. If anything, they’re the only ones who move fast enough.” This sounds quite ominous. In some ways, I’m reminded of recent architectural debates in which people seemed to side either with a revival of Jane Jacobs or with a revival of Robert Moses—where the latter camp claims that what we really need now is a kind of infrastructural dictator, someone who will get the job done, whether that’s high-speed rail or a new tunnel between New Jersey and Manhattan. But what are the political implications of the aerotropolis—and is a “high-functioning dictatorship” really the most appropriate form of government for such a city? Lindsay: Well, it’s obvious if you look at the projects under way that a great many of them are being realized by authoritarian governments, whether that’s China or the Middle East monarchies. Basically, the aerotropolis, or any kind of instant city project, seems to be enabled by autocracy. That’s the case whether you’re building an aerotropolis in Dubai or whether you’re building one in Beijing, or whether you’re building smart cities in Saudi Arabia. Saudi Arabia is building six “economic cities,” quote-unquote, which will double as aerotropoli. The Saudis are trying to revamp their whole air system, develop their national airline, and then also make these smart cites into job magnets, thinking that they could basically build a society from scratch. It’s funny that you’d mention Robert Moses, though, because I didn’t even really think of him in the context of this book. It’s gone beyond the scale of Moses. Moses was a regional planner operating in what is ultimately a democratic government. But you have planners—in fact, you have technocrats—who are commissioning and building whole cities now. I think Robert Moses would be a fantastic figure today—because he would be a vast improvement over some of the secret decisions being made in China over what they’re going to build, where, and to what end. This goes back to what I was saying about the war between cities. I was reading a description by Steven Cheung, a Chicago School economist who taught in Hong Kong. He presented a paper in Beijing in 2008 that was partially translated in Richard McGregor’s The Party, where he discusses the economic model that has driven China. His notion is that every city there is at total war with each other economically, in order to attract foreign investment. They’ll promise you everything, and they’ll move as fast as possible, and they’ll build whatever you need to make it happen. And that’s the same impulse behind the people who are building aerotropoli. You end up with a city like Chongqing, with 32 million people, where they’re building a massive new airport that will create hundreds of thousands of new jobs for the millions of people who were displaced by the Three Gorges Dam. On some level, I think in America we don’t even understand the level and the pace of change that is happening in China, where, because of decisions made by central planners, millions of people are being urbanized—literally at the flip of a switch, because they’re simply changing their legal status from “rural” to “urban.” Suddenly, three million farmers turn into three million urbanites, and now you have to find jobs for them, and situate them, and do all these things. In terms of the aerotropolis, maybe the most interesting developments will be in India. They intend to build, I don’t know, a hundred airports from scratch, and they are actively planning a few in the mold of Kasarda’s aerotropoli. And considering India is a democracy, it’s led to some massive political battles. They’re fighting over the land; they’re fighting over whether to build one above coalfields. It will be very interesting to see at what rapidity they can move forward with a true democratic process. But I think the classic example in the book is in Thailand, where Kasarda has been a teacher and government advisor for years and where he sold his vision of the aerotropolis to Thaksin Shinawatra—who was then the elected prime minister but was almost universally considered an oligarch. People who were involved in that process are still unsure that Thaksin ever understood what Kasarda was trying to tell him, or whether Thaksin simply saw it as a land grab—a way to install his own family members in development companies and reap huge profits from it. The flipside is Dubai. They screwed up a lot of things there but, through several generations of rulers now, they’ve understood that investing in infrastructure and investing in trade was the key to long-term success. [Image: The now-erased runways of Denver's old Stapleton Airport; the airfield has since become a New Urbanist residential development. Photo courtesy of the Colorado Department of Transportation]. BLDGBLOG: A few times now, you’ve mentioned the prospect of a failed aerotropolis—or at least an aerotropolis that is incorrectly implemented. I’m really curious about that—about what might happen to an aerotropolis if the growth of air freight and business travel doesn’t actually pan out as expected. In the book, you do touch on things like climate change and peak oil—but is it short-sighted, in a way, to build cities specifically around one form of transportation, one that might someday prove inaccessible? Lindsay: In terms of building a city around an airport, there’s a common misconception that we’ll be building homes right up to the fence of the airport. But the airports we build today are massive, and they have huge noise buffers around them, which isn’t the case at older airports. Denver’s old Stapleton Airport is a classic example of this, where people actually did live a couple hundred yards away from the runways, with all of the piercing noise. But when they built the new Denver International out beyond the city, it’s two miles from the runway to the border of the airport, and it floats on this sea of grass that nothing can ever get close to—though developers are trying. So, even though you’ll have fast access to the airport, it’s not like you’re going to look across the street and see planes landing. Then again, I live in brownstone Brooklyn under a flight path, eight miles from LaGuardia, and, on rainy nights, it sounds like planes are about to land on my desk. It’s all relative. As for peak oil and climate change, I devoted a whole chapter to them in the book. I believe wholeheartedly in peak oil—you simply cannot geometrically increase consumption of a finite resource—but I do believe that biofuels, likely harvested from micro-organism production platforms, can produce sustainable, replenishable jet fuel. The science is sound; the scale of production is what’s in question. But even if you think climate change is inescapable, or that peak oil will do us in first, and even if you think that aviation will go away and that globalization will stop, for good or for bad—but probably for good—to me, the question is: Are you willing to bet the future on that? Because what’s interesting to me is that, in China, India, and the Middle East—and anywhere else in the developing world whose cities have been cut out of globalization so far—they’re building these cities to connect themselves to the global economy, in which they intend to participate, if not someday to dominate. The more unsettling question that I wanted to raise in this book—rather than just cheerlead for airport cities, as some critics have accused me of doing—is ask whether we need to do the same to keep pace. Do we need to build or re-build our cities to more efficiently process goods and people? Or will these places collapse under their own weight? In China, the answer may be both. But this is the world we made—one-click shopping creating giant hubs in Louisville and Memphis—and this the world they’re making. It may end in disaster, or it could lift hundreds of millions of people out of poverty—and hurt our own economy further in the process. These are questions I wanted to leave to the reader. The reasons autocracies are so eager to embrace an aerotropolis or an instant city is because they’re willing basically to throw money and people at the problem in an attempt to catch up to us in an incredibly rapid timeframe. I was just reading the other day about Kangbashi, the “ghost city” of Ordos, China. It was built in five years flat for a million people. It’s interesting to me that they’re willing to work at this speed in an attempt to catch up, even regardless of the consequences. [Image: A rendering of New Songdo City, courtesy of Kohn Peterson Fox]. BLDGBLOG: I’d like to discuss the idea of the “instant city” more generally. It’s an evergreen vision, in many ways, and an ideologically promiscuous one, appealing both to the 1960s architectural avant-gardes and to the overseas forward-operating bases of military planners. In your own work, you’ve covered things like the “City in a Box,” New Songdo City, and Russia’s “silicon forest” where cities are basically treated as products that you can buy—like customizing a BMW off a website and then hitting the purchase button. Where is this sort of instant urbanism going, and who or what is driving it? Lindsay: The thread I see going through the book and the work I’ve been doing for Fast Company is the notion that the people who are planning cities today, and who have really gotten interested in urbanism over the last few years, are people who are neither architects nor planners. The city is experiencing a white-hot moment, and this is converging from a bunch of different areas. You have the whole camp coming out of Richard Florida’s work, for example, who have gone through the economic effects of cities and the cultural spillover of knowledge and training—basically, the notion that cities are engines of creativity and engines of ideas and job skills. Harvard’s Edward Glaeser is deservedly enjoying his moment in the sun for his academic work around these issues. To him, the key economic actor of the future is the city. Then you have the technology companies who have been piling in, led by IBM. This is what really led to the resurrection of the “smart city” a couple years ago, which is the notion that, coupled with the "internet of things"—assuming we reach a point of ubiquitous sensors and constant data flows—the city becomes the next computing paradigm. This has been discussed academically for decades, but now it might actually happen—or at least there’s a lot of money and corporate support behind it. Then you get to the notion, again, of infrastructure—of Kasarda, of the aerotropolis, and of people who are building cities as competitive weapons. Some of the most interesting things I like writing about are places like New Songdo City. Songdo is billed today as a smart, green aerotropolis, but it was invented by the Korean government at the insistence of the International Monetary Fund following the 1997-98 financial crisis, when the IMF bailed out Korea to the tune of $58 billion—which seems like nothing now. The IMF insisted the country open itself up to foreign direct investment. So its leaders decided to build a city for foreigners, and that led to finding an American—Stan Gale and his partners—to build a whole city from scratch off the coast of Korea. It was basically willed into existence by the necessity of paying back the IMF; that’s why Songdo was born. Or there are the smart cities being planned. Masdar, for example, is supposed to be a smart eco-city. Masdar basically exists to be an incubator and an R&D park so that Abu Dhabi can dominate clean-tech technology. Again, this is basically the city as an economic weapon, not a utopian vision. I find the people drawn to these projects equally fascinating. For example, Stan Gale is your classic story of American real-estate development. He’s a third-generation developer who got his own start in Orange County in the 1980s, and he witnessed the master planning and the financialization of real estate that began there; he then worked in New Jersey in the 1990s, where the market evolved into edge cities; and now here he is working at the global scale, trying to convince more Chinese mayors to help him build cities for them. He’s got a whole consortium of companies, like Cisco and United Technology Corporation—which, incidentally, builds more pieces of the city than I think anyone really knows. Otis Elevators, fuel-cells—all these things that you need for a project being built at the city scale. Someone else I find equally fascinating is Paul Romer, the economist who’s pitching the idea of the charter city. I’d like to think he’ll win the Nobel Prize for the work he did in the 1990s on what’s been called New Growth theory, which described increasing returns to scale. Paul basically decided that the best way to raise people out of poverty—the best instrument—is to build a city from scratch and use it as a tool for developing skills, trade and everything else. And it appears that he’s actually now found a country willing to let him do it, in Honduras. This is a man who has absolutely no urban planning background. Urbanism to him is secondary—he cares, but he’ll leave it to the experts. The urbanism itself is not paramount to him. It’s interesting to me that these outside elements—whether it’s a technology company or an economist or a developer—feel like the architecture and the urban planning is just—you know, we can get experts to do that for us. And it’ll be great. Architects like Kohn Peterson Fox, who are responsible for Songdo, rather than build a perfect city from scratch, basically borrow the best pieces of every city they can find to create a new city. And, you know, having been there a couple of times, I feel like it may actually work; I don’t know what the completed city will be like, but I feel like it’s working. Gale uses the phrase “city in a box,” which you mentioned, but they’re also saying things like “we’ve cracked the code of urbanism”—which is a hell of a statement to make. To think you’ve solved 9,000 years of urban practice and that you can just move on is quite dramatic. So those are some of the things I find particularly interesting: that the city has become this nexus of interests for so many people, only it’s being made or stimulated by people who aren’t architects or urban planners. 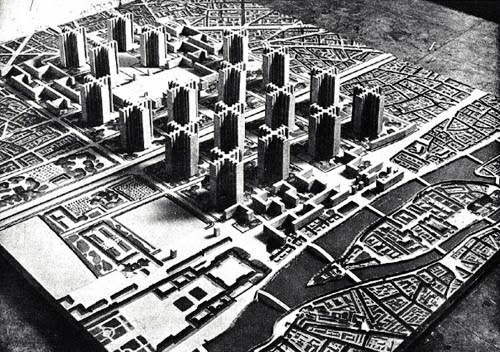 [Image: Le Corbusier's infamous Plan Voisin, meant to replace the heart of Paris, France]. BLDGBLOG: It’s easy to see how all this can sound quite technocratic and dystopian—which makes it all the more interesting that you open the book with an unexpected pair of quotations. One is from Le Corbusier, the other from novelist J.G. Ballard. To anyone familiar with Ballard’s work, in particular, I might say, this seems like a strangely subversive gesture against the book's own premise; it's like opening a golf course community and saying you were inspired by Super-Cannes. Why did you choose these quotations, and what effect were you hoping they would have? Lindsay: I’m so glad you brought that up. I’ve been curious what people would make of it. What I love about Ballard is the kind of dark irony of his work, which is something I find in Koolhaas’s writing as well. They know the future is slick and disposable, and they revel in modernity’s contradictions. They know how dark globalization’s undercurrents are, but go on despite—or even because of—them. The book reviewers who said the aerotropolis had “forgotten” a soul completely missed the point—these cities never had souls to begin with. That’s why I find them fascinating! The Ballard and Le Corbusier quotes should be read as a flashing red light, signaling to the reader: Caution: Unreliable Narrator Ahead. You’ve been warned. Especially that Le Corbusier quote: anyone who knows anything about urbanism who encounters that quote should immediately have their guard up—which was my intention all along. Thanks again to Greg Lindsay for having this conversation—including the second half, which you can read over at Work in Progress—and to Stephen Weil for all his help in setting this up. Finally, I hope to see some of you in Los Angeles at the A+D Museum on April 5th, when Greg Lindsay and I will pick up this conversation in person. The event is free and open to the public, and it kicks off at 6pm.